The wild & scenic Kern River carves out this oak lined canyon. The winding roads travels from Lake Isabella north along the river which is lined with camping. The pine mountains surrounding the valley are quite cool compared to the warmer temperature down by the river. Take a scenic drive up the river and into the pine forest back roads. The panoramic Sugarloaf Road runs the mountain ridge and overlooks the deep river valley. It is an excellent round trip day drive from Kernville in order to see this dramatic change of terrain plus see some nice views. 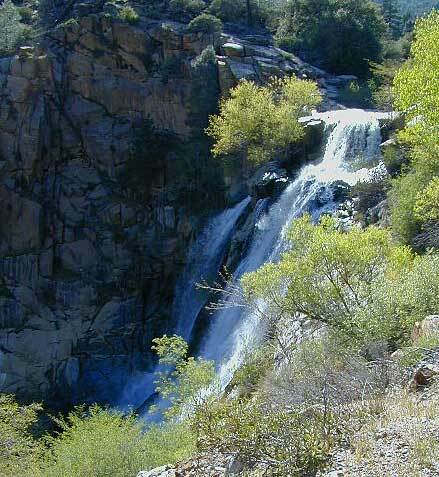 Pass waterfalls and explore the secluded woodlands. Picnic by a creekside clearing or in a reclusive meadow. Read a good book while relax in a hammock under towering cedar pines while or ride your mountain bike on the remote dirt roads. Kernville is a small recreation town located on the north shore of Lake Isabella, without stoplights, this small village is set in a narrow oak valley. It has a few antique shops, small inns and plenty of outdoor enjoyment: River raft, fish, hike, mountain bike, camp, horse back ride, rockclimb, boat or jetski on the lake. The adjacent Sequoia National Forest offers sightseeing and adventures: the southern most Sequoia grove -Trail of 100 Giants, the viewpoint -Dome Rock, granite spires - the Needles, the vertiginous steep walls of the Kern River Gorge. The crowds are sparse & the views breathtaking. in the Sequoia National Forest area. The Neill House is a Victorian home located in downtown Kernville, only one from shops and restaurants. A historical house which was rescued from the shoreline of nearby Lake Isabella and restored to it's full potential. Furnished with antiques and modern conveniences, it used to be a bnb - but is now a private residence. Itinerary Ideas: Drive north up the backside of the mountains via Highway 395 or Hwy.14, thru the Mojave desert & stay overnight at a living ghost town, then just a short drive west up Hwy. 178 gets you to Lake Isabella at the base of the Kern River Valley. Or just north on Highway 395, take the remote County Road J41 thru Kennedy Meadows to the Kern.